From 17 to 20 October 2019 at Casino de Spa. Online satellites, promotions and more! Join us in the next MEC Poker Open from 17 to 20 october 2019. 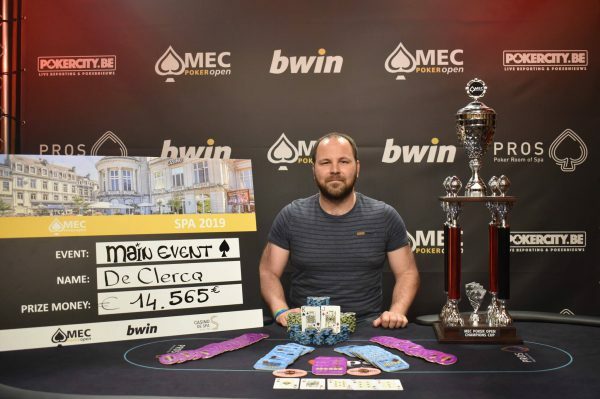 From 17 to 20 October 2019 the third edition of the MEC Poker Open will be held at Casino de Spa, Belgium. This event is for the (semi)- recreational poker player who prefers to play a high quality, low buy in casino tournament. The organization guarantees a nice poker experience in one of the oldest casinos of Europe. What is the MEC Poker Open? The MEC Poker Open is part of MEC Pokerevents. This company is famous for organizing the Open Dutch Championship of Poker with over 10.000 participants on a yearly base. The previous editions had a €14.000,- first prize! At the MEC Poker Open Spa there will be a Main Event with a buy-in of € 175,-. The Main Event has three different starting days. Check all the main event information here. FULL SCEDULE WILL BE ANNOUNCED 29 April 2019! Book your hotel or apartment through whatsapp! We have some great offers for the pokerplayers who want to spend the nights close to the casino during the weekend. Are you interested in a place to stay close to the Casino? Contact us, book, and pay via whatsapp. During the event weekend we offer different cashgame tables. We think €1,- / €1,- No Limit Hold em and €2,- / €2,- No limit Hold em will be the most demanded tables. You can find all the cashgame information on our cashgame page.